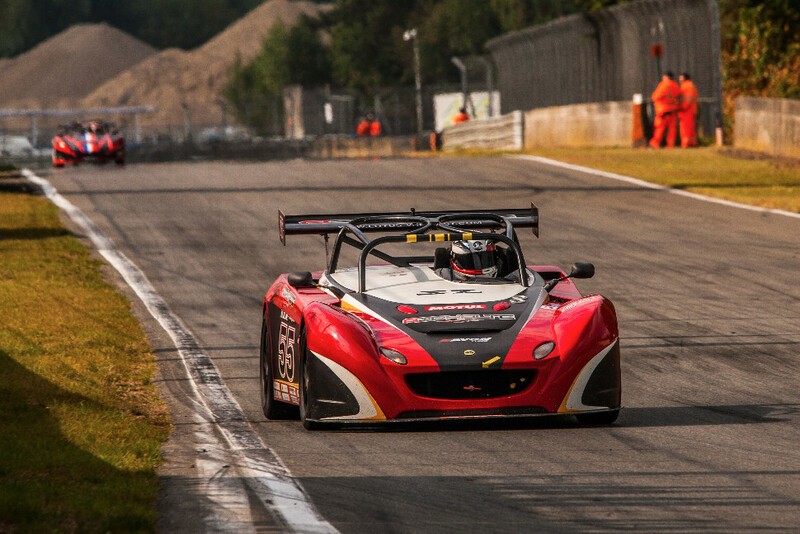 Belgium’s former Grand Prix venue, set in the country’s Flemish region, has become a regular fixture on the Lotus Cup Europe calendar, and once again staged the penultimate rounds of the season. It also marked the return of Xavier Georges, who had missed the previous Brands Hatch event, and the Frenchman would be heading a group of drivers aiming to knock Steve Williams off the top of the podium. This group also included the Evora of Jon Packer and the Swedish pair of Tommie Eliasson and Robin Nilsson. The title situation was looking increasingly in favour of Tamas Vizin, and the Hungarian was aiming to continue his clean sweep of victories to stay on course for beating John Rasse’s record from last year. Meanwhile in the 2-Eleven class, Christophe Lisandre and the Loups would be continuing their rivalry, whilst Harry Woodhead and the Laroches would also resume their fight for supremacy. The summer break seemed to have refreshed Georges, who topped both practice sessions and qualifying to take pole position. His rivals took turns to challenge, with Spa-Francorchamps and Brands Hatch winner Williams second in the opening session, before Packer and Jean-Baptiste Loup took over, the latter claiming a front row slot for the races, the gap between the two just under four tenths of a second. Williams would share row two with Nilsson, ahead of Lisandre, Eliasson and Packer. Thierry Verhiest headed Philippe Loup, with Andrew Wright completing the top ten. Behind him was the 2-Eleven of Jean-Pierre Genoud-Prachex, who headed the leading Open class Exige of Woodhead, just one place in front of category rivals Christopher and Franck Laroche. Down in 19th place, Vizin once again took the Production class pole, four grid slots ahead of nearest rival Sven Pettersson. Dave Carr and Mark Yates were next up, and with Thierry Hedoin last, having failed to set a time, an interesting fight looked set to play out, even if just for second place. J-B Loup made the best getaway from the rolling start and led Georges, whilst Williams slipped behind Lisandre, with Nilsson and Packer following behind. The two Evoras would make good progress, to battle for third place early on, whilst ahead of them, Georges made the most of his V6 power to take the lead in the opening stages of the race. Packer’s race would come to a premature end, his Evora pulling into the pits at around two-thirds distance, however there were no such troubles for Williams’s car. He made his way past Loup’s 2-Eleven and set off after Georges in the late stages. He would reduce the lead, but the Frenchman was not to be denied upon his return and took his first win since Paul Ricard in May. The gap between the leading pair was just over three seconds at the chequered flag, and J-B Loup would take another podium finish, almost ten seconds in arrears. He kept class runner-up Lisandre at arms’ length at the end, whilst Swedish V6 pairing Nilsson and Eliasson crossed the line a few seconds down the road. The latter had spent much of the race trying to overtake Verheist, and when the Belgian ran wide at the first chicane late on, Eliasson seized his chance. 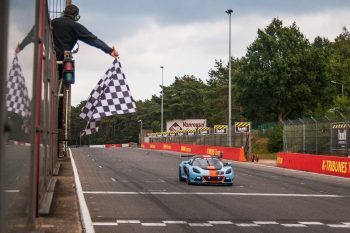 The top ten was completed by J-P Genoud-Prachex, David McInulty and Open class winner Harry Woodhead, who finished one place and 18 seconds ahead of rival Franck Laroche. 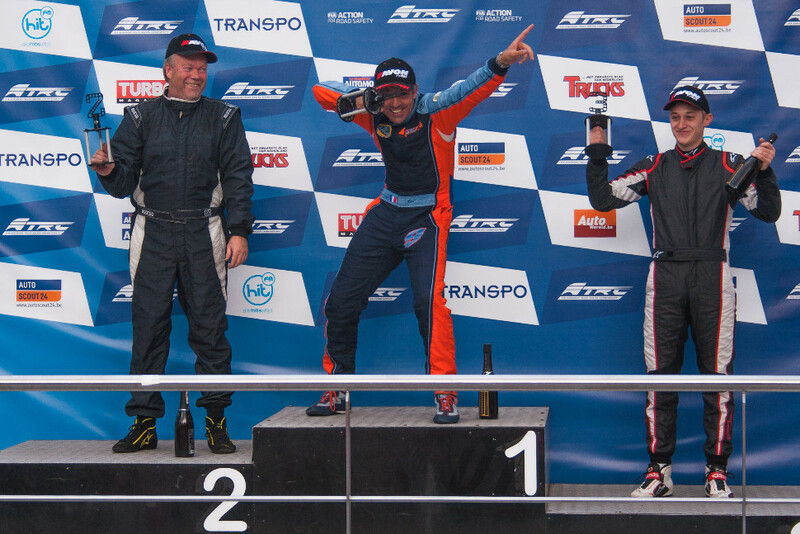 The Production class fell to Vizin once more, and he was nearly 14 seconds ahead of Jason McInulty, who had a race-long battle with Dave Carr for the place. Following his startline troubles at Brands Hatch, Williams made a much better attempt off the line to lead into the first corner. However, despite taking relative caution, still found traction at a premium, possibly finding the tarmac a little greasy after the previous truck race. Heading onto the back straight his Evora spun into the gravel, and with the following pack taking avoiding action, several cars exited the race there and then, including both Genoud-Prachex 2-Elevens, and Neil Stothert. Inevitably the safety car was called into action as the track was cleared, and Williams was able to rejoin. When the race restarted, Georges resumed the lead and was locked into an intense battle with Lisandre for the race win. This lasted several laps, but Lisandre was given a pitlane drive-through penalty for overtaking under yellow flags, and this spoilt his challenge. Also falling foul of the stewards was Packer, who might have finished well up the order otherwise. The beneficiaries were the Swedish Exiges of Elliason and Nilsson, who both stood on the podium, whilst Philippe Loup took the 2-Eleven victory, however his son dropped to the tail of the order. Wright, Packer and Lisandre all finished ahead of Williams, who took eighth ahead of Open class victor Christopher Laroche. The top ten was completed by Benoit Roger’s 2-Eleven. With 13th overall, Vizin took yet another Production class win and with it, the overall title, such was his lead in the standings. Understandably he was jubilant, having defeated Jason McInulty and Dave Carr, the latter inseparable on track once again. A triumphant return for Georges, who took his first double victory and finished Williams’ victorious run. However much of the focus was rightly on Vizin, the new champion, who is set to move up to a new class for Le Mans; how he gets on we’ll see in three weeks’ time as the 2016 season draws to a close in spectacular style at the 24 Heures Camions event.